You are browsing the Blog for Dreams Archives - Marja-Leena Rathje. As I continue to sort through slides and prints and post to my gallery, I am occasionally surprised by work that I have forgotten about. The above piece is one of those. It is a one of a kind piece with print elements, drawing and cheesecloth. Other than the slide, which fortunately was labelled, I could find no records of it nor could I find the piece either. Perhaps there are some notes in an old sketchbook? Did I sell it or trade it or destroy it? This is not very professional of me! I am happy to have found this image and am rather fascinated by it. It is for me a revisit of a period where I seem to have combined elements from two print series, the Veils Suite and Dreams. These two photographs dropped out from inside some papers I was sorting through while looking for something else, as often happens. 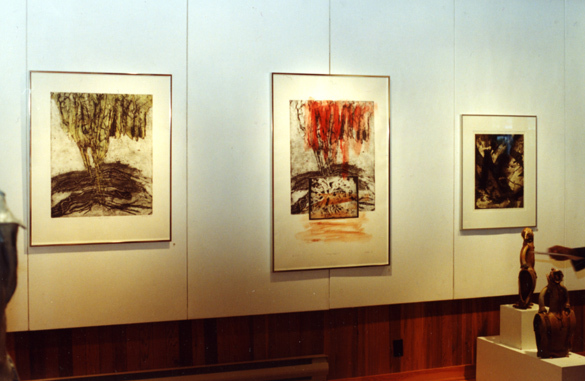 They are installation photos of some of my printworks in an exhibition called Forms and Figures at the Ferry Building Gallery in West Vancouver back in 1993. This was noted on the back of the photos but with no mention of the other two or three artists also in the exhibition. Memory fails me now, though I think I might know but don’t want to make any mistakes. If I come across the information in an another poke through my messy files, I’ll add it here. On my summer break from the print studio, I really must get back to my small home studio to continue the tidy-up I started last summer as well as sort through a new mess! At the end of the ‘Veils Suite’ series of prints, I created some prints called ‘Child’s Play’ and ‘Child’s Dream’, based on an actual dream I had. In this dream, my little daughter danced happily into our bedroom early one morning, waking us up. She was in a ‘dress-up’ costume with a sheer veil over her head, like a bride. It was a very vivid image and a rare experience for me to be able to recall a dream so clearly, perhaps because I really did wake up then, fully expecting to see my veiled girl in the room. The titles reflect the make-believe dreams that children act out in their play. 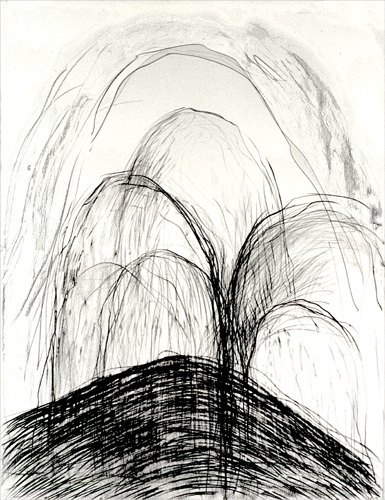 The print ‘Untitled (Dream Passages)’ is a later development of ‘Child’s Dream’ and became a transitional piece between the two series. 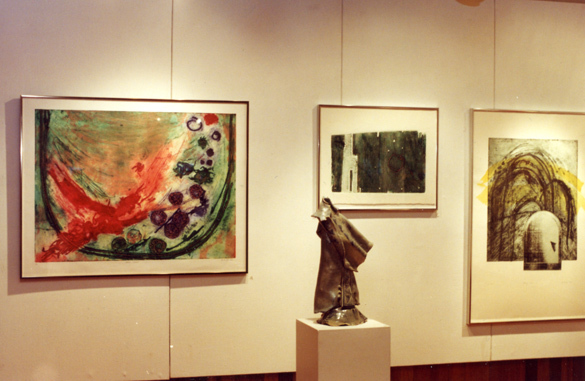 From these works grew a desire to continue to explore the concepts of dreams and memory, as I was at that time caring for my father in his last years. He was living with us, missing my mother greatly after she passed on, and had health problems that affected his memory. His confusions about past and present and his mixing of dreams and reality really made me aware about how much our memory and even our dreams make up our unique personalities, and how we function in day-to-day life. Edited Jan.13.2013 to show larger image. Please view the print Memory/Dreams II to compare. 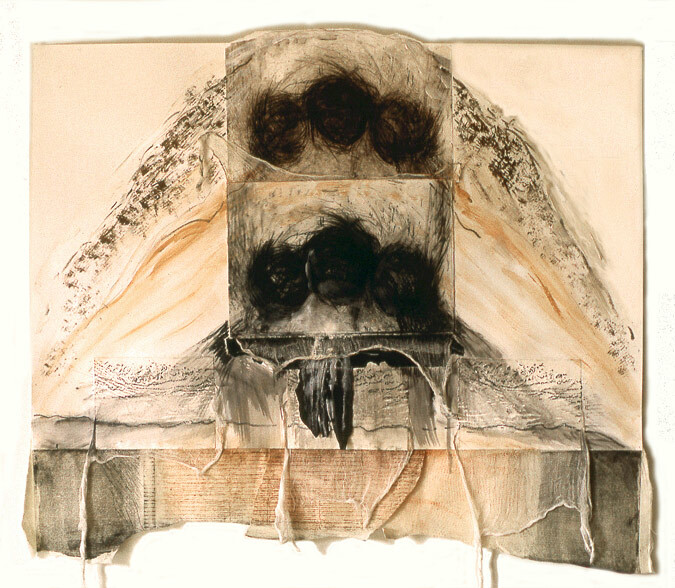 “The Collagraph print is best described as a collage printmaking technique, where the image is composed from a variety of textured materials glued to a substrate and printed either in an intaglio or relief fashion.” – from EKU. 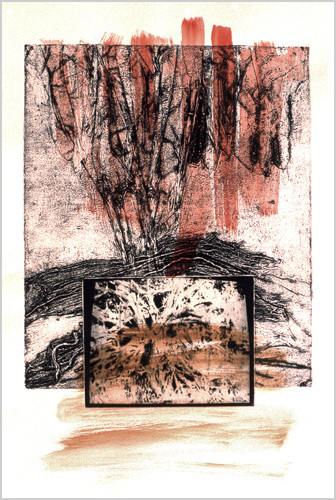 “In a collagraph, the plate is built up and manipulated by the artist, using a collage-like process which combines materials as diverse as cardboard, fabric, gesso, glue, string, sand, carborundum grit, and found objects. The artist can also draw lines into the gesso before it hardens. 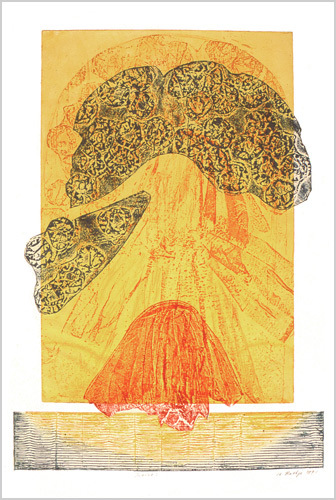 As a result, the plate may print as both relief and intaglio. 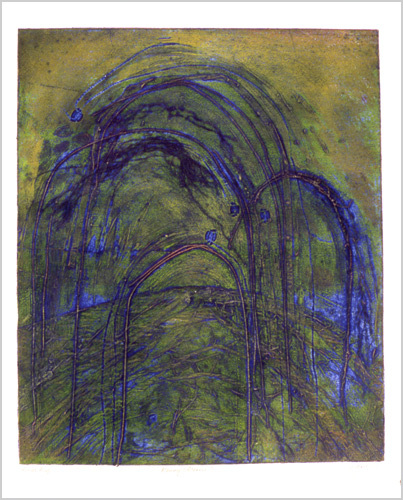 Collagraph prints are usually pulled on a press.” – from Washington Printmakers, a good site on printmaking techniques. Back in March, I wrote two posts What is a Print? 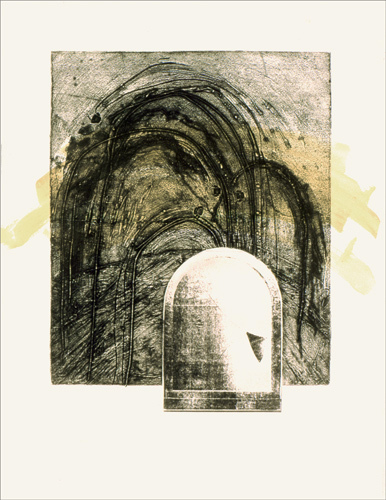 and More on Prints, which give some links to sites about printmaking techniques. Interesting that they did not include the collagraph. 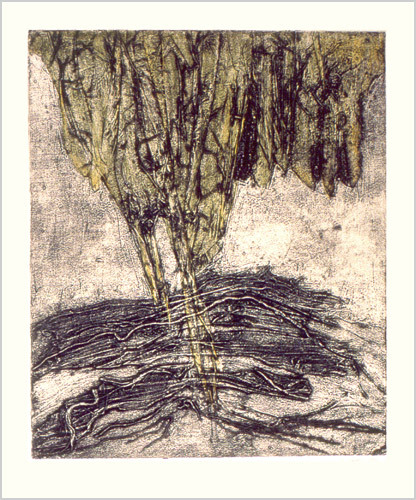 The Dreams series of prints that I have been putting up recently, are all utilizing the collagraph technique, sometimes in combination with other media. I am currently working with collagraphs again, now in combination with inkjet prints – I will show these when they are done. I usually like using matboard as the plate, and with acrylic medium I glue on textures like string, cloth, tissue paper, as well as utilizing the medium’s painterly textures, and pressing in textures using various objects. It’s a very enjoyable and non-toxic process that gives interesting results!